Pregnancy yoga is a key ingredient to a healthy, happy pregnancy. 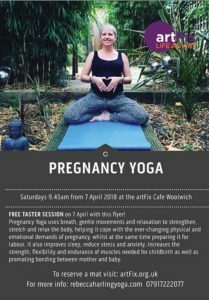 Pregnancy yoga is designed to support the changes that happen in a pregnant body by offering women healthy, safe ways to breathe and move their muscles and strengthen their bodies and minds to ease the process of supporting a growing baby. Pregnancy yoga calms the mind and eases any tension and anxiety that the mum may be carrying. It helps women prepare for labor and delivery. Teaching trust, relaxation and simply being in their bodies. Pregnancy yoga promotes a wonderful connection between mum and their growing baby. Prenatal yoga may provide relief from common pregnancy discomforts such as lower back pain, nausea, insomnia, headaches, shortness of breath, and carpal tunnel syndrome. By stretching and toning muscles, mums-to-be can help blood circulate throughout the body in a healthy way, and deep breathing can bring much-needed oxygen to baby and to their own muscles. It also helps pregnant mums to connect with other mums in a nurturing, supportive environment. Rebecca Is a 390 hour trained yoga teacher who has completed specialist training in pregnancy yoga. Rebecca is a mum to Amélie Iris (4 months old). Her own journey through pregnancy and motherhood inspired her to deepen her knowledge and train in postnatal and pregnancy yoga. Rebecca’s classes are for students of all abilities and they feature a calming but fun flow with a focus on breath and alignment.